RANCHI, India (CNS) — Theodore Kiro held 13-month-old Navya on her return to his family after they were separated for a week. The crying baby happily clung to Kiro, whom she knows as her grandfather. Navya is one of the four babies whose fate became entangled in the recent child trafficking scandal broke at Rachi’s Nirmal Hriday (Tender Heart) home, run by the Missionaries of Charity. A five-member district child welfare committee decided it was not fair for the foster mother and the child to be separated for long and ruled they should be united conditionally. The welfare committee asked the foster parents to take the child before the committee every week and keep it informed of the child’s schedule. “The child and the mother were in trauma after separation, so the committee members decided compassionately to unite them. But this status has been fixed for the next two months only,” said Kiro, a local political leader using his clout to prepare legal papers for adoption of the toddler. Navya was brought to their home in Ranchi just after her birth and was reclaimed by the child welfare committee as one of the babies who allegedly was sold illegally by an employee of the Missionaries of Charity home. Though the parents confess that there was no exchange of money yet, the officers are investigating the process of adoption without proper paperwork. This makes Anuka Tigga, another adoptive mother of a 4-year-old, jittery. She is scared for her child after the central government announced July 17 that all records and child care homes run by the Missionaries of Charity will be inspected and adoption processes scrutinized. “It is not that I have committed any wrong. Rather, these happenings will adversely affect the well-being of my child,” said Tigga. 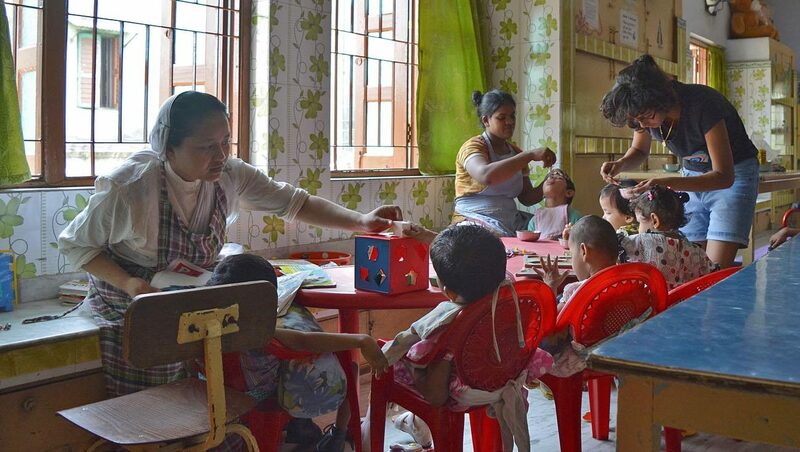 The Indian Ministry for Women and Child Development has directed the state governments that all child care institutions should be registered and linked to the Central Adoption Resource Authority within a month. Many mothers such as Tigga question the fate of children already living with adoptive parents, for fear the government will say the process was not followed and their children will be taken away. In 2015, the Missionaries of Charity stopped offering adoption of children because the Indian government introduced new rules making it easier for single women and men to adopt. The government rules said prospective adoptive parents must pay a fixed amount of 40,000 rupees ($580). Police said Jharkhand state’s Child Welfare Committee came to suspect the Ranchi home was involved in the illegal trading of children after a couple complained they were not given a child, despite paying 120,000 rupees (US$1,850) as an adoption fee. Sister Mary Prema Pierick, superior general of the Missionaries of Charity, said in a July 17 statement from Kolkata that the order was cooperating with authorities, and that when a lay employee, Anima Indwar, admitted to the welfare committee in early July that the baby had not been given to the couple, Indwar was handed over to police. During recent raids at Nirmal Hriday and Shishu Bhawan (Children’s Home) in Ranchi, 11 unwed pregnant women were shifted to government homes and 22 children, including one child as young as a month old, were sent to the Karuna Center, a government-run home. Navya’s family complained that, after the separation, they found their child to be in a miserable condition in the government facility. Those children who remain in many of homes run by Missionaries of Charity are destitute, orphans and unwanted children who are nursed and cared for and prepared for adoption through the Central Adoption Resource Authority system. The police are investigating now as to why the nuns continued to keep children in their facility when they were no longer a registered body for adoption. The norm has been that though the unwed mothers are provided with nursing and support by the nuns, it is the responsibility of the guardians and families who want to adopt to register with the child welfare committees. The nuns and the Missionaries of Charity staff facilitate the process. The Missionaries of Charity and other Christian bodies are questioning the intention of the government in the recent actions against the order. They say that, after the arrests of Indwar and Sister Concelia, the nun in charge of accompanying mothers and babies to the welfare committee, the Missionaries of Charity were not given a chance to be heard and were not warned about the raids. The Christian community and some politicians are also questioning the role of the media, which widely published a video of Indwar’s confession leaked by police. Police have seized record books from the Missionaries of Charity homes in Jharkhand state. Christian leaders say this is deliberate antagonism by the state’s extremist Bharatiya Janata Party government, which has accused the Missionaries of Charity of religious conversion in the pretext of social service. Sister Concelia was sent to two weeks of judicial custody. After the incident, Mamata Banerjee, chief minister of West Bengal state, where the religious order is based, called the actions against the Missionaries of Charity a move to undermine the work of St. Teresa of Kolkata, who founded the order. Abraham Mathai, former vice chairman of the Indian Minorities Commission, has asked for independent judicial inquiry if need be to stop what he calls persecution of the Missionaries of Charity, saying it is bringing disrepute to the whole organization.